In all of the hotel's 41 rooms you can find a big screen LCD television, a manually controllable climate, spacious bathroom, broadband and wifi internet connection. Alongside with Superior double rooms, Deluxe rooms, Junior suites and a Presidential suite is on the range. The VinoSense Spa is Hungary's first wellness center which offers vinotherapy. Cave baths combined with massage elements, swimming pool, jacuzzi, various saunas, a salt chamber, colour therapy treatments provide relaxation and recreation. The VinoSense Beauty Farm offers a wide selection of vinotherapeutic massages and cosmetic treatments. n the hotel children can entertain themselves on a playground, and children's accesories are also at service. Use of the parking facility (large enough for buses as well) is free of charge for hotel guests. 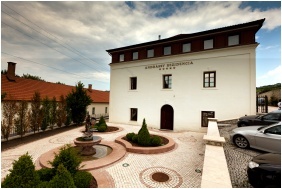 Check availability and best rates in Andrassy Residence Wine & Spa!